There are times where an assignment is more like a birthday present than an actual job. 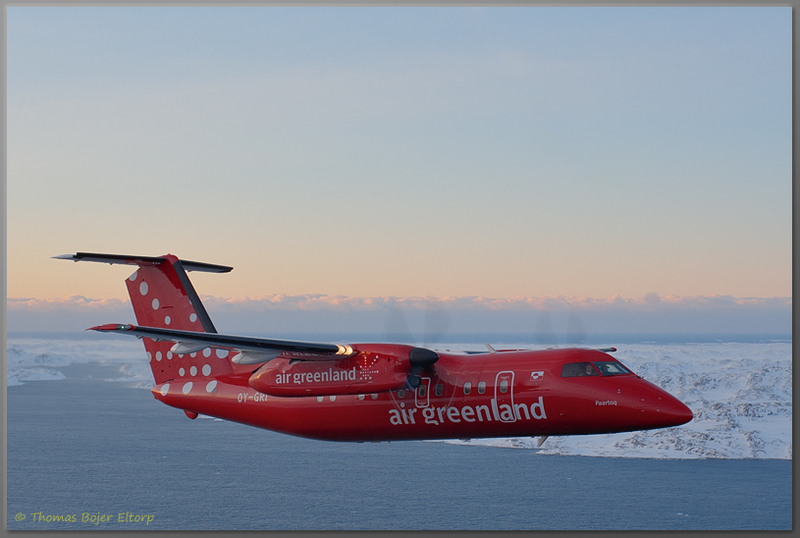 The chance to shoot Air Greenland's brand new Dash 8 in flight is definitely such an occasion. 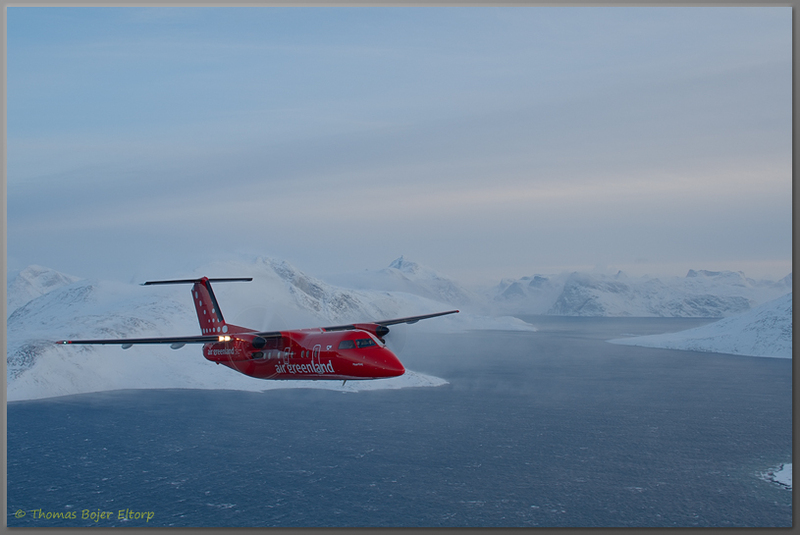 Now this post has been some months under way as images needed to go public in the Annual Report and the in-flight magazine before being posted elsewhere, but I still think both the images and the story is worth sharing. The request came in shortly before Christmas, well early December actually and with a deadline of end 2011 it did not seem too bad. 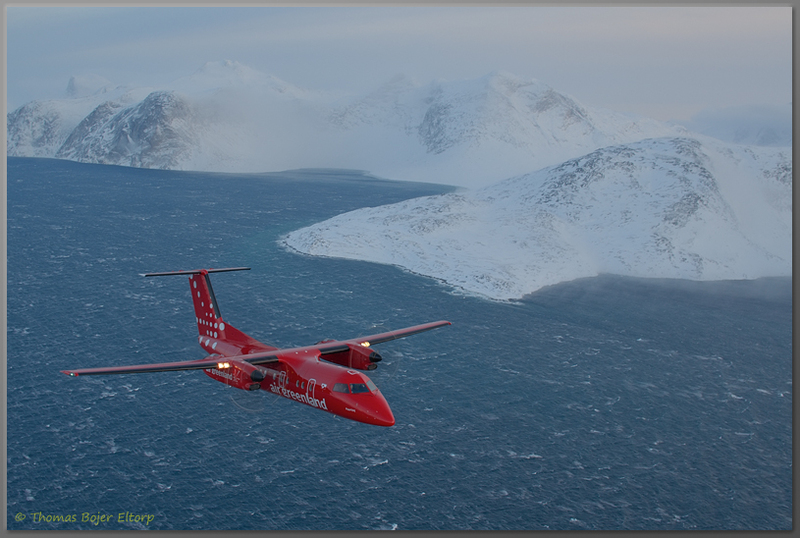 Conditions in December in Nuuk however, does not favour air to air photography. Temperatures rarely go above -15C, daylight is only a few hours a day and the light is something more like afternoon/evening light than real daylight. Add to that a December where gale force winds and blizzards or heavy cloud cover seemed to continue without stop and you are in for a challenge. We scheduled several slots, but each one got cancelled as weather turned bad before daylight arrived, finally on December 30th things started to lighten a bit, clouds were spreading east of Nuuk, but a northerly wind at 30 knots coupled with the -15C temperature and the need to fly with an airspeed of +125 knots with the door open did not sound overly promising. Lasse (assisting me on this assignment) and I, never the less suited up and got ready. We had the helicopter rigged up with harness attachment points, sliding door, strapped the gear bags in and got ready to go. After that we did the initial briefings and clearances with the airport tower and operations staff. Finally we did a very detailed walk through with the pilots, they are very serious about their business and flying in tight formation is not something to take lightly. Especially not with winds blowing at 30 knots, down wash from rotors and me hanging half way out the side of the helicopter to consider. All geared up and with the communication routine locked down, we handed over the flying to the expert pilots and they took us through the initial bumps of take off and into flight. An hour worth of freezing our rear ends off, with an open door in the helicopter and some world class flying from the pilots later we had the shots bagged. Including those sunrise shots the marketing people need for their add campaigns. What I liked even better, we got several images showing the true conditions under which these skilled pilots work on a daily basis. As we approached the airport, the sky turned black and snow started to roll in again, so as luck would have we used that perfect one hour window available. as to the temperature in the cabin of the helicopter, well it was really cold., Cold enough for our pilot to find out that his flying boots were frozen to the pedals and needed some work before he was able to leave the helicopter. I have done air to air work before, but never in arctic winter conditions and badish weather before. 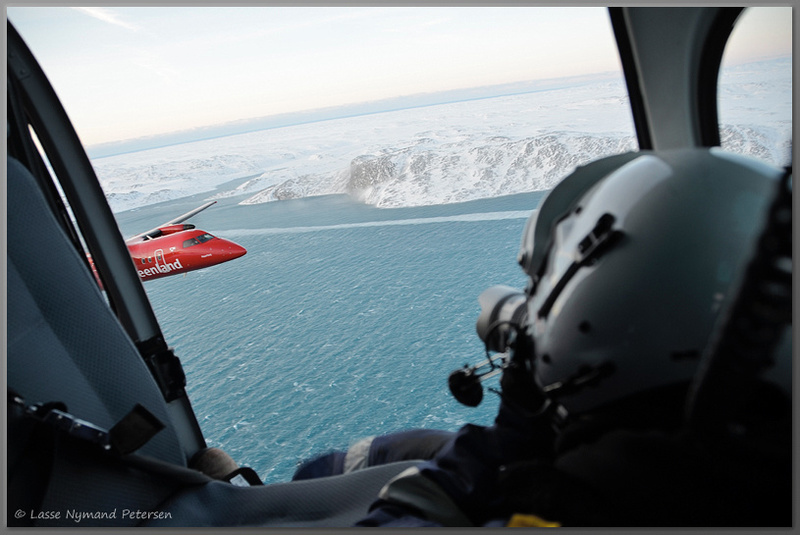 I had a healthy dose of respect for the skills of the pilots flying for Air Greenland before, but this experience kind of put those skills in perspective, I would not have been able to do my job without their world class flying, or Lasse in the back to keep my safety lines under control and handling lens changes.